I don't know exactly how much money has been ploughed into marketing this year's Rugby World Cup but they should see a refund because the no doubt countless millions spent by Unions, broadcasters and sponsors around the globe could never compete with Samoa's historic victory over Australia as an advert for the sport's showpiece event. The suits at the International Rugby Board, Rugby World Cup Limited and Rugby New Zealand 2011 must be giddy with excitement following the Samoans outstanding display that not only accounted for the world's second best side, according to the somewhat dubious rankings, but also sent a shockwave through the rest of the rugby world. Suddenly, it's game on at RWC'11. This is the kind of result that makes the sporting public, not to mention rival sides, sit up and take notice. For some it will come as a complete shock but those who witnessed Samoa cranking through the gears against Ireland, England and Scotland at the end of last year could have warned you of the potential dangers. Australia may well have opted to rest a host of their leading players but second string or not - they were outplayed. This fact is alone will have already given Wallabies coach Robbie Deans a headache, before he even contemplates analysing the horror-show that will be the game, because there is no way a that a country boasting a wealth of resources, both on and off the field, should be coming off second best against a side that has to live off relative scraps. As a result, you can expect that new contract from the Australian Rugby Union to go back in the drawer for a couple of months because I fear a backlash if Deans is seen to be rewarded for this disaster with a new bumper pay deal. The result and, more importantly, the performance will keep many rugby minds busy over the coming months. Wales, in particular, will be sitting a little more uncomfortably in their cryotherapy chambers all too aware of their recurring Samoa-themed nightmare. South Africa will also double their efforts ahead of their World Cup showdown with the giant-killers while Australia and maybe even England loom as potential foes in the knock-out stages. But let's not get ahead of ourselves. The manner of the victory and the mechanics behind it are for those on the front line to worry about - the rest of us can delight in result itself and the timely boost it provides the game as a whole. Samoa's ability to punch above their weight - metaphorically speaking - is a testament to the hard work of the players and coaching staff and their collective faith. The IRB continues to talk a good game when it comes to investment in the game outside of the major nations - and they will have the figures to back that up - but Samoa and their like remain bit part players on the edge of the elite game. In despite of this not-so-level playing field, the Pacific islanders continually time it right for the big show. Samoa, Tonga and more notably Fiji made a big impact on the 2007 World Cup and they may well find another couple of gears in New Zealand in a couple of months' time with the added bonus of what will be as close to a 'home' crowd they could hope for at such an event. Samoa do not strike you as a side short on belief but a win such as this is sure to add fuel to that fire. But the fallout from their first win over the Wallabies - and a southern hemisphere giant come to that - will impact more than the 185,000 or so residents of their Polynesian home. That renewed confidence may well prove to be contagious and while not all the competing nations at the World Cup may have the required arsenal to make a statement as indelible as Samoa's, priceless victories will be there to be won - no matter how small. 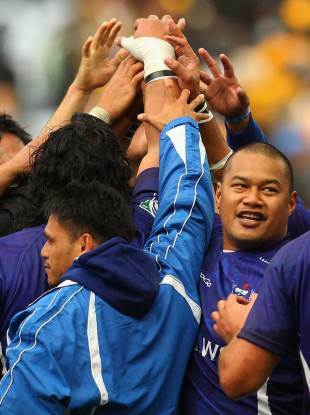 The tournament itself will be so much richer for the herculean efforts of Samoa. Rugby fans were always going to be enthralled by the events in New Zealand throughout September and October - that comes with the territory. But general sports fans that may have been turned off by the thought of the sport's major powers leading a procession to the title-decider will have suddenly seen their interest roused once again with the promise of the much-prized upset. These are the kind of casual supporters who could recall Argentina's tango through the 2007 tournament in France or New Zealand's habitual choking but come this time in the World Cup cycle they need a little reminder - a worthy viral campaign, a black shirt controversy or better still a large dose of what sport does best - drama, excitement and the unexpected. Those are also the ingredients that creative minds across the globe endeavour to capture in a bid to draw you in to the tournament. But why settle for someone else's perception of what might be when you have teams as gutsy as Samoa prepared to deliver the real thing? If the same kind of money spent in selling the tournament was distributed as aggressively within those nations not blessed with the resources of the sport's elite then international rugby would surely all but market itself. Thank you, Samoa - and bring on the World Cup.